This babka is very different from my Easter babka. 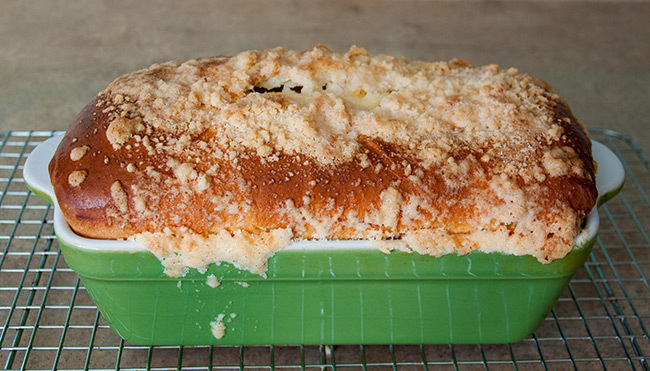 The Polish style that I make for Easter is laced with raisins, but this babka is a richer butter dough that is filled with a creamy cheese filling. When you cut into this loaf you will see the swirl of thick cheese filling throughout. I make this style of babka for a Sunday brunch or for any other special occasion. I even gave everyone at work their own personal loaves for Christmas presents once. Stir yeast with warm water. Set aside for 5 minutes to activate yeast. Grease three 9×5 inch loaf pans. Warm the milk till very warm and then place in a large mixing bowl or stand mixer. Add butter and stir to melt. Add sugar, salt, yeast mixture and egg yolks to the milk and butter. Add flour and knead until shiny and elastic. Place in a greased bowl, turning to coat both sides, cover with plastic wrap and let rise until doubled. This may take as long as 2 hours. Prepare the crumb topping by mixing the flour and sugar and then cut the butter into the flour and sugar as if you were making pie dough. You want the butter to be the size of large peas. Prepare the filling by beating the cream cheese until light and fluffy then slowly add in the sugar and salt, followed by the egg yolk and finally the flour. Turn your dough out onto a lightly floured work surface and divide the dough into three equal parts. Working with one part at a time and covering the rest with plastic wrap, roll each piece into a large rectangle to an 1/8 inch thickness. Spread the dough with 1/3 of the cheese filling. Fold in the sides of the dough and roll the dough up carefully so that the filling stays inside the dough. Place in prepared pan. Brush with beaten egg wash and sprinkle with 1/3 of the crumb topping. Repeat with the remaining pieces of dough. Cover with greased plastic wrap and let rise until the loaves have risen just above the rim of the pan. Place your oven rack in the center of the oven and heat to 350 degrees. Bake babkas for 40-50 minutes or until an instant-read thermometer registers 190 degrees. A cake tester will come out of the center clean just like for a cake. Let cool in pan for 5 minutes. Using a knife, loosen babka from the sides of pan, and then allow to cool for 30 minutes in the loaf pan. Then turn out onto a cooling rack to cool completely. This Babka looks amazing! Would love to see a sliced or open view of Babka. Can you use a bread maker for this? Also can this be frozen before it has been baked? I have made this babka a number of times now and absolutely love your recipe. I’ve eaten and made many different kinds but this one really wins out, in my opinions. Thanks for sharing it! !